Appropriate Water Supply – The location must have high-quality water supply, one of the most important tools for a hydroponic greenhouse. The quality of water intended for use will be tested and deemed appropriate for irrigation purposes for optimal plant growth. site. Estimates for these expenses still need to be determined. Space – The site and access driveway must have sufficient room for truck access and maneuverability for the shipment and transportation of goods. 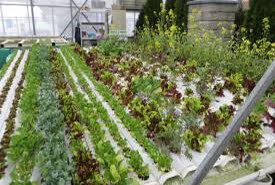 Topography – The greenhouse(s) location must be in a non-flooding area and level plot of land to avoid drainage problems. Level land facilitates product movement and workers will not have to worry about working in wet or unsafe locations. Licensing & Permits - Licenses and permits are required to operate a greenhouse, and must be obtained prior to the commencement of business operations. These will be acquired by contacting the Montgomery Planning Board. While this process could be time-consuming and could take up to several months, LetUsConnect Farm does not foresee any difficulties in obtaining all necessary paperwork to begin construction. Greenhouse Orientation – The greenhouse must be situated away from winter and summer tree shadows to ensure light is not obstructed and additional heating costs are not incurred due to an overabundance of shade. 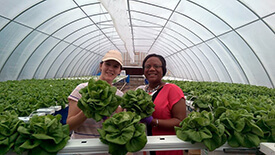 Suppliers – LetUsConnect Farm has identified several reputable suppliers with which it will be working for hydroponic supplies and equipment needs. Additionally there are suppliers that are conveniently located within a short driving distance of the businesses’ location. 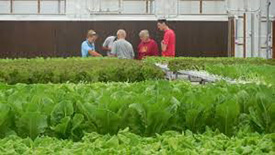 When LetUsConnect Farm obtains all the necessary zoning requirements and permits, the organization will utilize the services of RIMOL Greenhouse Systems to build its hydroponic greenhouse farm. RIMOL, headquartered in New Hampshire, has been around since 1994 and is a very well respected company known for building custom, high-quality, and long-lasting greenhouses for its clients. LetUsConnect Farm will initially construct a 30ft. X 96ft. training/production hydroponic greenhouse, followed by up to nine additional houses. There are a variety of different styles and sizes of greenhouse structures to meet our needs. This step is one of the most critical steps in the building a greenhouse, and can determine the functionality and effectiveness of our entire operation. When looking at how to build a greenhouse, the greenhouse structure needs entry and exit ways that are both functional and fit the specific look that we are trying to achieve. We will need double sliding door to meet ADA requirements. Choosing the proper covering is a key step in creating an effective growing environment in your greenhouse structure. RIMOL Greenhouses offers a variety of coverings in different materials and thicknesses to ensure that we have options to select the exact covering that fits our needs and budget. These coverings are strong and durable, and will not tear under harsh weather conditions such as snow and wind. The options are for double wall poly 8mil plastic or a more expensive option is for polycarbonate sheeting. The second option is more durable and will last 15 years. The poly film will last five years and will cost around $3,000 to replace plus labor. A common question when people ask how to build a greenhouse concerns greenhouse ventilation. It's imperative that we include a way to cool our greenhouse structure to keep plants from overheating. There are a variety of cooling systems, including options for mechanical ventilation, natural ventilation, and shading. The greenhouse plans must include proper heating for giving the plants a suitable growing environment. There are heating options for every type of grower, including propane and natural gas heaters, oil heaters, convection tubing, hot water heaters and more. Natural gas is the most affordable option but propane may be the only practical option. We have explored solar, but the Township does not believe it is possible at this site. In order to create a functional and energy-efficient greenhouse structure, it is essential that we maintain complete control over heating and cooling. From simple thermostat systems to more advanced computer modules, there is a wide range of environmental control options. These controls are easy to understand and extremely user-friendly. It is recommended that an automated system is included in the greenhouse structure for both ease of use and consistent temperature and air circulation in the greenhouse. Before we begin the project, we must be sure to obtain a building permit from the local government, and understand the construction and taxation of the structure. Permits needed include zoning and building electrical and utility. 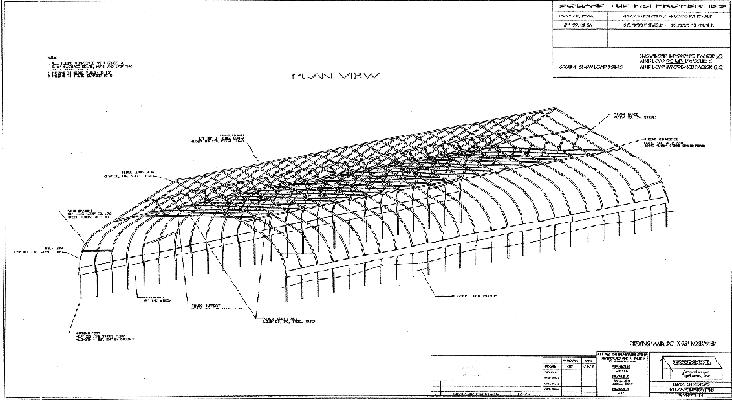 Depending on the greenhouse selected, stamped engineering drawing may be required. Every town and city has local ordinances that may require additional permitting. 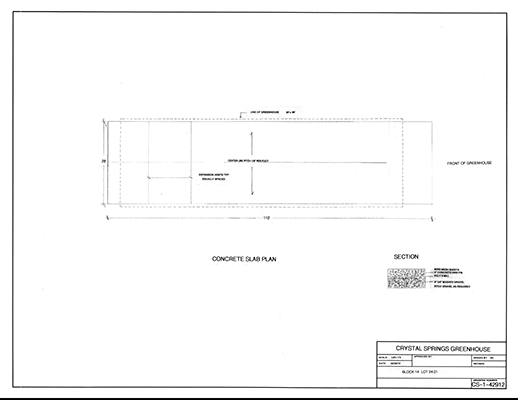 A site plan will also have to be prepared and submitted to the zoning and building offices. As we have not yet identified the exact plot where the first greenhouse will be built, this is somewhat unknowable. However, we recommend that a concrete slab to provide for easy cleaning and mobility be installed. Finally, after selecting all of the equipment that will make up the hydroponic greenhouse, we will need to contract with certified electricians, plumber and builders. While this may seem like a daunting task, we have numerous instruction manuals and fact sheets that will help construct the greenhouse without a problem. 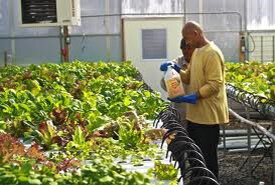 Arthur & Friends and the staff of SpArc will supervise installation of the hydroponics.